Xewjni Bay is our favourite Marsalforn beach and offers one of the most beautiful and pristine bays in Gozo which can be enjoyed throughout the whole year. You can watch the waves break against the boulders caused by the blasting winter winds or else rejoice in the tranquil waters glittering beneath the Mediterranean sun during summer. The quaint Marsalforn beach is completely peppered with pebbles and starts very shallow from the shore. You can rent your own deckchair and sunbed for about 3 Euros each. The area offers a wonderful variety of Marsalforn restaurants all romantically dotting the stunning coastline and you cannot leave Gozo without treating yourself to a delectable seafood dish at least once. Being quintessentially a fisherman’s village, it is no surprise that most of these Marsalforn restaurants offer seafood dishes. To add some extra zest to your meal, why not try and book a table at your Marsalforn restaurant right by the water’s edge? The remarkable sea views enjoyed will truly complete your experience, no matter if you’re having an afternoon lunch or an evening dinner. The salt pans located in Xwejni offer a marvellous location for long walks to quite the mind, accompanied by a gentle breeze from the sea. Deeply steeped in history, they know their origins to the Phoenicians and proudly stretch to about 3km along the coast. They are cut out from the rock and form part of the old Gozitan tradition of sea-salt production. This sea-salt tradition has been passed down for many generations. If you’re a super early riser, you can see the salt farmers harvesting the shimmering salt crystals from the yellow rock during the summer months. Whilst you’re there, why not buy a bag of pure Gozitan sea salt and use it to season your dishes? Although it may be five times smaller and perhaps not as ostentatious as the Christ the Redeemer mountain in Rio de Janeiro, the statue of the Risen Christ located on Tas-Salvatur hill is still very much worth the climb. The last part towards the top will entail some effort from your part and will leave you gasping for breath, however the rewarding 360-degree panoramas will surely continue to take your breath away – in a good way. The statue stands six meters tall and offers an excellent spot to snap some epic pictures of Gozo’s rolling hills. Wandering along the Marsalforn promenade will allow you to catch a glimpse of island life by night. The area becomes alive and is magically transformed by the glistening waters; all the restaurants dotting the coast will be buzzing with activity, locals taking lazy strolls or just simply chatting with one another. 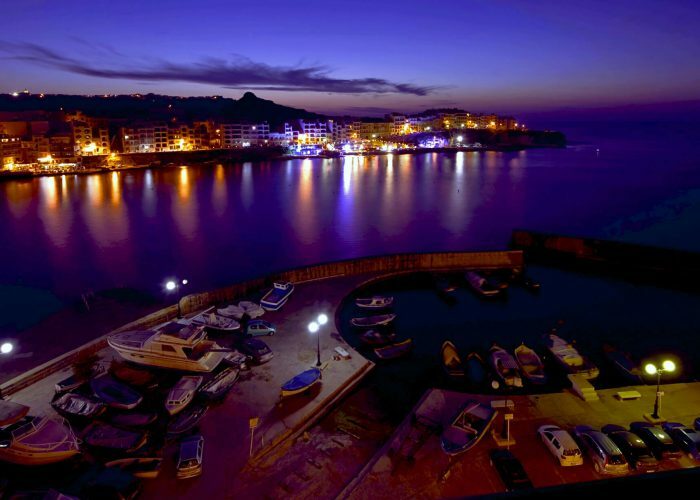 There is something about being next to the sea, and the Gozitan locals surely know how to make the most of it!. Gozo has been awarded as a top European diving destination in Europe and Marsalforn village has certainly played a vital part towards this title. It is home to quite a few popular dive spots that offer fantastic topography, visibility and the chance to explore some underwater life. Some of these locations include Reqqa Point, Shrimp’s Cave and Billinghurst Cave.